In the Cepher Qolasiym (Colossians), Pa’al gives an interesting instruction. Well, this begs the question, doesn’t it? Who are these people who were worshipping angels, and why is it that we don’t know of this practice? Then YAHUAH turned, and gave them up to worship the host of heaven; as it is written in the cepher of the prophets: O you house of Yashar’el, have you offered to me slain beasts and sacrifices for forty years in the wilderness? 43 Yea, you took up את eth the tabernacle of Molek, and the star of your elohiym Remphan, and figures which you made to worship: and I will carry you away beyond Babel. In this verse, we have an interesting combination of factors, because this reference is actually drawn from the Septuagint, and not a Hebrew text. We often find that in fact, everything but the Torah appears to be referenced when it appears in the New Testament from the Septuagint, rather than Hebrew. (See Hebrews 10:5-6 and Psalm 40:6). 26 καὶ ἀνελάβετε τὴν σκηνὴν τοῦ Μολὸχ καὶ τὸ ἄστρον τοῦ θεοῦ ὑμῶν Ραιφάν, τοὺς τύπους αὐτῶν, οὓς ἐποιήσατε ἑαυτοῖς. [transliteration] kaí anelávete tín skinín toú Molóch kaí tó ástron (constellation or star) toú theoú ymón Raifán, toús týpous aftón, oús epoiísate eaftoís. [translation] And answer the tabernacle of Moloch, and the star of the goddess of Rephaim (Raifan), the types of these which thou hast made thee. With all of this being said, one wonders if Amos is construing the star as being the star of the giants, as compared with or instead of the star of Remphan. However, when you review the Ivriyt (Hebrew) you see that the text is markedly different. [Transliteration]: V’nasatiym eth sikkuth molekiym v’eth kiyun tselemikim cocav ELOHAYKEM asher asaithiym. And lift up את eth the tabernacle of Molek and את eth the idol of phantom illusions, the star of your elohiym which you made. The children gather wood, and the fathers kindle את eth-the fire, and the women knead their dough, to make kavvan (sacrificial wafers) to the queen of heaven, and to pour out drink offerings to other elohiym, that they may provoke me to anger. And when we burned incense to the queen of heaven, and poured out drink offerings to her, did we make her kavvan (sacrificial wafers) to worship her, and pour out drink offerings to her, without our men? I hate, I despise your feast days, and I will not smell in your solemn assemblies. 22 Though you offer me burnt offerings and your grain offerings, I will not accept them: neither will I regard the peace offerings of your fat beasts. 23 Take away from me the noise of your songs; for I will not hear the melody of your viols. 24 But let judgment run down as waters, and righteousness as a mighty stream. 25 Have you offered to me sacrifices and offerings in the wilderness forty years, O house of Yashar’el? 26 But you have borne את eth the tabernacle of Malkam and את eth the Kavvan (sacrificial wafers) of your images, the star of your elohiym, which you made to yourselves. 27 Therefore will I cause you to go into captivity beyond Damascus, says YAHUAH, whose name is ELOHAI TSEVA’OTH. So, we have reached that point in our discussion here where we must discuss that ever so controversial star of Remphan, the star of the elohiym of the disobedient house of Yashar’el, found in chapter five of the Cepher Amoc (the book of Amos). There is a plethora (yes, that is the word) of commentators who have concluded that the star of Remphan (Raifan, Rephaim, Repha’iym) is in fact the six-pointed star of David, sometimes called the Magen David. There are those who point to a calculation which yields 6-6-6 (six points, six triangles, six inner points). Okay, let’s stop right there. The number given in Chizayon (Revelation) 13:18 (which isn’t a number at all, but three Greek letters which are supposed to be representing certain numbers in the Greek numbering system similar to the Hebrew gematria) is six hundred, sixty and six, not six-six-six. This construction of six-six-six is pure ignorance, and is the most abused concept in all of scripture. The translators, who apparently could not determine what the word actually was (χξς), and not being able to render a word (although some have speculated what may have been here), then elected to count it as a number, assuming that the chi was 600, the tsi was 60 and the stigma was 6. Never, not ever, was the number six, six, six. So, the fact that you can prove six points, and six triangles, and six implications or whatever, means absolutely nothing. When you establish six hundred points, sixty triangles, and six (whatever is left), then we might have a discussion. Have at it. Okay, so what do we have left in the argument which condemns the Magen David? We have the no false images argument. We will get to that here shortly. And he took up his parable, and said: Bil`am the son of Be`or has said: and the man whose eyes are open has said: 16 He has said: which heard the words of EL, and knew the knowledge of EL ELYON, which saw the vision of EL SHADDAI, falling into a trance, but having his eyes open: 17 I shall see him, but not now: I shall behold him, but not nigh: there shall come a star out of Ya`aqov, and a scepter shall rise out of Yashar’el, and shall smite the corners of Mo’av, and destroy all the children of Sheth. 18 And Edom shall be a possession, Se`iyr also shall be a possession for his enemies; and Yashar’el shall do valiantly. 19 Out of Ya`aqov shall come he that shall have dominion, and shall destroy him that remains of the city. Well, it looks like a star of some sort is going to come out of Ya`aqov and a scepter (i.e., a kingship) shall rise out of Yashar’el. One could wonder who that might be, but you wouldn’t have to wonder long, because David would rise up and do just exactly what this passage prophesies he would do. The name of David in Paleo Hebrew is spelled ΔYΔ, or dalet, vav, dalet. Now the dalet is a door, and the vav is a nail, so we have the idea of two doors being held together with a single nail. (Of course, in the nail, you can also see the image of the crucified MASHIACH). This nail holds together two doors: one, the door of the sheepfold of Yashar’el; the other the sheepfold of Yahudah. Consider the phrase: “your will be done on earth, as it is in heaven.” While some attribute this concept that “as it is in heaven, so it shall be on earth,” to occultic (or worse) origins, there are numerous references and images which lend legs to the notion that this is in fact a divine attribute. So, it is easy to see the paleo dalet, and the inverted paleo dalet in the magen david. The only thing missing is the vav in the middle. (Ain’t it the truth!). Because the vav (the nail) is missing, the two houses are not held together. 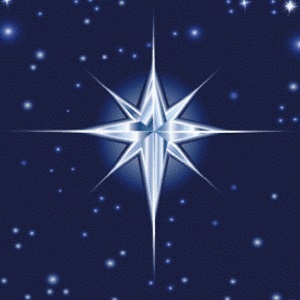 Now, let’s take a look at that Christmas star everyone likes to put on top of that Christmas tree, shall we? Remarkable resemblance. I wonder if there is any spiritual significance to this star of Ishtar? Well, sure enough, there is. 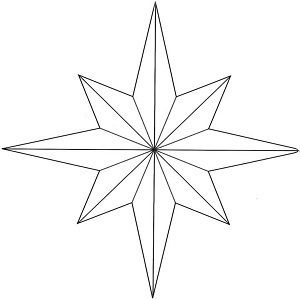 The four longer points of this star point out the winter solstice (the northern point, called Yule), the vernal equinox (the eastern point, called Oestre), the summer solstice (the southern point, called Litha), and the autumnal equinox (the western point, called Mabon). The other four points are February 2 (called Imbole), April 30 (called Beltaine), July 31 (called Lugnassadh), and October 31 (called Sahmain). I will also stretch out my hand upon Yahudah, and upon all the inhabitants of Yerushalayim; and I will cut off את eth-the remnant of Ba`al from this place, and את eth-the name of the Ke-mariym with the priests; 5 And those who worship את eth-the host of the heavens upon the housetops; and those who worship and that swear by YAHUAH, and that swear by Malkam; 6 And את eth-those who have turned back from YAHUAH; and those that have not sought את eth-YAHUAH, nor inquired for him. So, we have a clear marker that those who worshipped the hosts of the heavens were in Yahud. They were those who were the remnant of Ba`al, the priests who worshipped idols, and those who also swore by Malkam, the elohiym of infant sacrifice. But let’s take a look at this word Kemariym for just a moment. This discussion goes to the name of the Kemariym, not just Kemariym. Who are they? kamar (כָּמַר) (Strong's 3648) is a primitive root, meaning to intertwine or contract, i.e. (by implication) to shrivel (as with heat). That is to say, to shrink. And Lavan went to shear את eth-his sheep: and Rachel had stolen את eth-the idols that were her father's.
. . . 34 Now Rachel had taken את eth-the Teraphiym, and put them in the camel's furniture, and sat upon them. And Lavan searched all the tent, but did not find them. 35 And she said to her father: Let it not displease my lord that I cannot rise up before you; for the custom of women is upon me. And he searched, but did not find את eth-the Teraphiym. And Laban had gone to shear his flock; and Rahel stole the images. For they had slain a man, a firstborn, and had cut off his head; they salted it with salt and balsams, and wrote incantations on a plate of gold, and put it under his tongue, and set it up in the wall, and it spake with them; and unto such their father bowed himself. Was this head a shrunken head? Maybe. If the skull is removed, and then salted it with salt and balsams, the skin would be preserved and would shrink. Bear in mind that the word used here – Teraphiym – is a plural word. Rachel was departing with the shrunken heads her father Laban consulted. So, what was this name? Was it Teraphiym? Was there a worship of shrunken heads also happening in Yahudah and among the inhabitants of Yerushalayim? 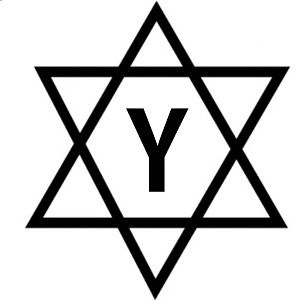 The record of angel worship in Yahud (Judea) is recorded in the second book of the Kings, the Cepher Melekiym Sheniy, who tells us that at the time of Yo’shiyahu, Yahud and Yerushalayim were full of workers with familiar spirits (necromancers), wizards, Teraphiym, idols and abominations. Moreover, את eth-the workers with familiar spirits, and את eth-the wizards, and את eth-the Teraphiym, and את eth-the idols, and את eth all the abominations that were spied in the land of Yahud and in Yerushalayim, did Yo’shiyahu put away, that he might perform את eth-the words of the Torah which were written in the cepher that Chilqiyahu the priest found in the house of YAHUAH. 25 And like him was there no king before him, that turned to EL-YAHUAH with all his heart, and with all his soul, and with all his might, according to all the Torah of Mosheh; neither after him arose there any like him. And those who worship את eth-the host of the heavens upon the housetops; and those who worship and that swear by YAHUAH, and that swear by Malkam; 6 And את eth-those who have turned back from YAHUAH; and those that have not sought את eth-YAHUAH, nor inquired for him. Our clue here is the passage that says that those who worship the host of the heavens do so from the housetops. In short, they are star gazers, who worship the host of the heavens. I believe its reasonable to assign this worship to the followers of astrology and the signs of the Zodiac. When the viewing of the stars becomes an interpretation the stars and planets, and their influence on human interaction, astrology becomes idolatry. 15 Take you therefore good heed to yourselves; for you saw no manner of similitude on the day that YAHUAH spoke to you in Chorev out of the midst of the fire: . . .
19 And lest you lift up your eyes to the heavens, and when you see את eth-the sun, and את eth-the moon, and את eth-the stars, even all the host of heaven, should be driven to worship them, and serve them, which YAHUAH ELOHAYKA has divided to all nations under the whole heaven. You are wearied in the multitude of your counsels. Let now the astrologers, the stargazers, the monthly prognosticators, stand up, and save you from these things that shall come upon you. 14 Behold, they shall be as stubble; the fire shall burn them; they shall not deliver את eth-themselves from the power of the flame: there shall not be a coal to warm at, nor fire to sit before it. As we can see, the ancient world was a little bit more than just a handful of handcrafted wooden idols and a little star gazing. It appears there were shrunken heads and a lot of astrological forecasting, and well as divination and necromancy (talking with the dead). Not a pretty place, and one that we are cautioned to avoid. I imagine some of you already knew all this, but sometimes it is worth it just to put it together again.